It's Friday, it's been a long week, so we all need a little humour to get the weekend started. Thankfully a Walmart employee has served up a clanger for us to enjoy, though it's a mistake with an undeniable logic to it, regardless. As you can see above, someone baffled by the whole anti-gravity thing in Mario Kart 8 has decided that Mario's chubby face being the right way up in a poster is the priority, and unimportant stuff like the title and all text doesn't necessarily have to be readable. In theory, it works, as it inadvertently highlights the fact that the game's main new feature is the ability to drive on tracks that are upside down. It's humorous, though we should be fair and point out that mistakes like this can easily happen. As anyone with history working in retail knows, part of the job is pretending to understand a load of products in which you have no interest or background knowledge. Yet still, nice to see Nintendo's marketing and branding, even in better examples like this MK8 art, getting mis-appropriated and presented in a confusing manner. Walmart, we salute you. @Retro_on_theGo Oh, lighten up! We're writing about video games for crying out loud; there's nothing wrong with having a little fun at the same time! Best LOL of the DAY!!!! This gave me a nice LOL moment. I worked in retail for a few years back in the day, so I can attest to the line, "...part of the job is pretending to understand a load of products in which you have no interest or background knowledge." You had one job! ONE!! Coming soon to the ∩ !!M. Oh man, I'm so excited about 8traKoiraM! Hey, give him a break. Maybe he mains Mario while playing MK8 right until he splashes some water on his face and scrambles to work. It's like seeing one of those pictures where the mouths and eyes of a person are upside down, but the rest of the picture is right and it feels completely uncomfortable. Well, we can all read the 8! And this must be a really old poster anyway, it does not even have the release date. And here I was considering getting a Job in the Walmart Electronics Department if my GameStop hiring falls through... I'd be the only person there who actually knows what video games are.. I think the fact that he put Mario right side up testifies to the employee's basic knowledge of video games. The problem seems more to be with his knowledge of how words work. Plot twist: It's actually everything else in the shop that's upside-down. Never heard of this store. is it new? Heh, and that's why I love that game. @MegaWatts Speaking of lightening up, you may recall that NL itself playfully ribbed "Fox News" for having a slow news day when they devoted a whopping 26 seconds to a MK8 video. Forget how relevant this is, I find it to be amusing and I'd probably share it too. 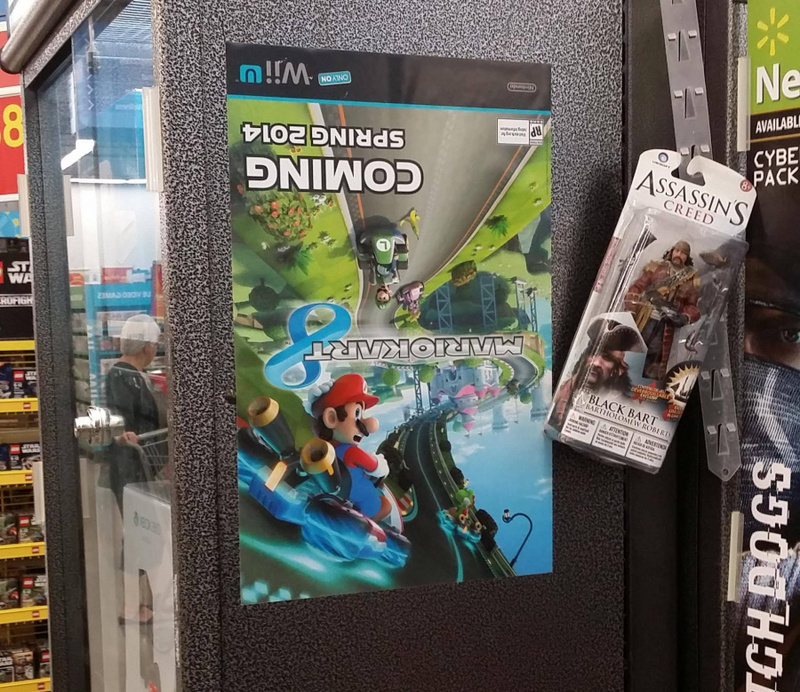 It's fun to look at MK8 boxart upside down, but this one has taken the art of flipping stuff upside down further. This may actually be more effective than having it right side up, actually. Advertising and marketing is all about making your product stick in the mind of consumers. Your brain tends to "skip over" stuff that isn't out of place, so the upside down poster is likely to catch the attention of people who would otherwise have not taken any notice of it. They did this at my local Best Buy, too. @CaviarMeths Reminds me of a sign I saw in someone's car the other day. It said right way up "^ Right way up ^" and upside-down "If you can read this I am in serious trouble." You mean I'm not suppose to sit on my head while playing this game??? Now you tell me. I've had so many head rushes for no reason! Half the people working at Walmart can't speak English, so this isn't surprising. Similarly, I had seen a few copies of The Amazing Spiderman 2 on Wii U being displayed upside down at a store just yesterday. And most of the people that shop at Walmart can't read anyway. The comments here, however, ARE funny! Hahahahaa! I expect nothing less from Walmart! This is flippin' fun, right? Certainly made me look twice! It's actually rather striking oriented that way. In a way this is like extra marketing for Nintendo. Wal-Mart employees are confused often. What if this was done on purpose? If humans could do this we wouldn't have a problem. Genius! Everyone who walks past it will stop and wonder why it's upside down leading to more interest in mario kart. This poster reminded me that I didn't play MK8 at all yesterday due to being sick. I should rectify that today, though. Bring on the anti-grav! @sinalefa LMAO!!! It didnt even occur to me to look at the 8! Or a really new one, and doesn't need a release date considering the game is already out. If -and I hardly could believe otherwise- this was intentional, it's a brilliant move indeed. And this kids is why you want a quality education... do your homework. Well if this didn't happen at Wal-mart I would have been surprised. 8TRAK OIRAM: Where can I buy this game? 8-Trak; now that's retro, LOL! Even though it's upside down, it's still pretty effective! This could happen to anyone, though I think the upside-down text would be a dead giveaway! 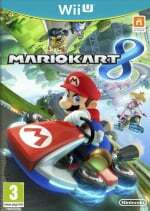 I know we have Mario Kart 8 flags at some registers at the Walmart I work at. I managed to snag one. coming soon to a PS4 near you! Guys… stop making fun of this guy or girl. You don't know them. Do you really want to make fun of Toph? Actually, it's a very old and wonderful MARKETING PLOY. Do you guys ever wonder why sometimes you see "Laundrymat" signs upside down? It was an old gimmick in the 60's-70's, etc, to get people to come in. It sticks in their mind, etc. Either that, or the employee was stoned out of their mind. lol Or both. But look at the box cover art, isn't that upside down as well? BEST NEWS ARTICLE YET!! Thanks for sharing!! did YOU hang that up bro? That's hilarious haha I did get a free MK8 poster free with ONM UK magazine and this poster is in it too. Not the exact one but the same image if you get me. It's pretty cool! I'm pretty sure that was their intention. A pretty intelligent one. @TechnoTaylor Racecar is a pallendrome. That's so Awesome! Can't blame the guy - I have the other poster, where Mario is not upside down, and it has written "turn your world upside down", well... upside down. It does it's purpose, though - I mean, it grabs attention, which is a point of a poster, right? Turn the poster upside down to get even more attn.?????? GENIUS!! !